And we're back! Last week, while DDP was still on vacation, a new shop opened up in downtown Downey. It's called Creamistry. It's similar to Coldstone Creamery, in that you choose exactly what you want to go into your ice cream. 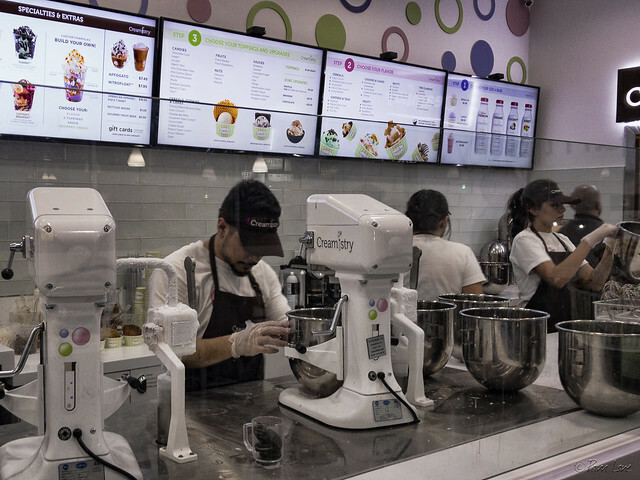 The difference is that, at Creamistry, you watch your ingredients be frozen right in front of you, in a process that uses liquid nitrogen to create a rich and smooth (and ice particle-free) concoction. I love ice cream, but I hate crowds more, so I'm still waiting to try this out myself. Be sure and let us know what you think!